Growing pains chiropractic asks why we have no clue of the cause. Growing pains chiropractic asks why we simply seem to have no clue of the cause of this sometimes quite disabling condition; is it real or attention seeking, or behind it is there a real problem? When doctors have no idea what is the cause of a problem, in adults they call it a virus, or stress and, in a child, growing pains. But you as a parent know that your child is not whingeing about nothing; they are in pain. If you scour the net, the first thing that will strike you is that no one seems to have a clue as to what is really the cause of growing pains. There are any number of theories and opinions, but nothing that is substantiated. Certainly it has nothing to do with the growth spurts of a child, and the term is almost certainly inappropriate. There is a cause, but your doctor just doesn't know what it is. So, growing pains; just what are they? I'm not going to pretend to be a know it all, but having treated many children I know that pains particularly in the lower limbs are a reality. If it's bilateral, in both legs, then one is less concerned. Of particular consequence is that some serious diseases begin in childhood; written off as growing pains they can lead to lifelong problems. Does your child have pain in one leg only? Then be more concerned. Does he or she have a limp? Then a careful and thorough examination is mandatory. Growing pains medical, though there is no certainty of this, is that they are neuralgic in nature; and that they are associated with the muscles rather than the joints. Anterior thigh, knee and the calf appear mostly affected; the lower limbs. There is no sign of swollen or angry joints. Making a diagnosis of growing pains is a hazardous business, because one has to rule out more serious disease. To be certain your child doesn't have juvenile rheumatoid arthritis or Perthe's disease for example, xrays and blood tests must be taken. One difference is that children with serious disease, for example, as yet undiagnosed leukaemia do not like being touched as it hurts. But gentle massage and movement appears to relieve growing pains. Read more at Kid's health growing pains site. Growing pains chiropractic would suggest this probably has more to do with joint hypermobility than being neurological in nature. We know that in adults hypermobility is certainly problematic; show me a person who can pick strawberries without bending their knees and I'll show you someone with lower back issues. Hyper mobile joints are far more prone to become painful. All children are hypermobile; the joints are not yet fully formed and the range of motion is excessive. Capsular ligaments are stretched to their limits during sport, and the mechanoreceptors are apt to complain. That can certainly refer via neurological pathways back to the spine, and then to the muscles pertaining to the joint. But in my book it's not primarily neurological, but orthopaedic in nature. So, normal "growing pains" if we insist on calling them that, are not uncommon or of great concern in the child, particularly if he or she is very active and sporting. There is no swelling associated with the pain, no limp and it's usually bilateral; one week the pain is in the right knee, and next in the left. Some gentle massage of the tissues around the joint, ice followed by heat for pain control, and gentle exercises are the order of the day. Laying off sport for a few days or a week may be indicated. Assuming it soon passes, neither medical nor chiropractic treatment is indicated. Abnormal "growing pains" are another matter altogether. Is there hiding behind these complaints something real happening that needs attention, and perhaps an immediate assessment? One of the key signs is a limp. Please, if your child starts to limp, then take it seriously and get a professional opinion. And be very cautious about accepting a cursory opinion that your child is merely suffering from "growing pains." Likewise, if there are definite signs of redness, a swelling or bump, or if your child starts running a temperature. Perthe's disease is a very serious hip condition in the child; miss it and your he or she is doomed to a lifetime of disability and pain. A limp is the key sign, with stabs in the groin and radiating to the muscles in the front of the thigh down to the knee. Osgood Schlatter's disease gives a painful swollen lump on the shinbone, just below the knee. Active use of the thigh muscles, straightening the knee as in running and jumping hurts. Aggressive bone cancers love the area just above and below the knee. 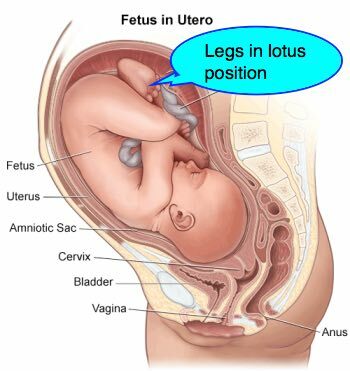 Hip dysplasia is characterised by an abnormally formed socket, often if the foetus in uterus did not lie in the usual lotus position that forces the ball into the socket. Later the child presents in our clinics with what we might term growing pains chiropractic. A mild hip dysplasia can cause serious pain later in life, yet without obvious arthritic change. Notice in the x-ray below of a seven year old girl how the left socket does not have a rounded appearance; it slopes upwards allowing the hip to subluxate and if it it clunks then it's more serious. It's noticeable that the ball protrudes, but only very slightly; it is only marginally "unroofed". This girl has been diagnosed as having growing pains, but hiding behind the hypermobility of her hips are distinct signs of a mild hip dysplasia. Nothing was diagnosed at birth by the paediatrician, there's no clunking of the hip, it doesn't subluxate but she has aching legs. I hope in ten years time to put up another view of this girl's pelvis, and see what transpires. Meantime she has specific exercises to strengthen the muscles around the hip, chiropractic help to check the sacroiliac joint which regularly fixates, and an insert in her shoe to correct the leg length inequality. Prevention is the name of the game; otherwise there's a significant possibility of early hip arthritis, and several total hip replacements. Interestingly she also gets a tender area just below the knee where the patella tendon inserts onto the tibia, but with no swollen bump on the bone. It's often after sport, and resisted knee extension is painful. At this stage it would appear to be normal "growing pains" but we watch to be sure that there is no Osgood Schlatter's disease developing; that's another "growing pains chiropractic." Your child is even more dependent on healthy choice foods than you are because of the rapid turn over tissue. This is particularly true of the DNA. There's a much greater likelihood of growing pains chiropractic on a crappy diet. Allow him or her to eat food that is deficient in minerals and vitamins, proteins, and the best fats and carbohydrate and it will leave its mark on his body or mind, or both. Certainly school performance and behaviour will be be affected. The benefits of folate tells a story. Go from Growing pains chiropractic to pubic bone pain. Perthes disease of the hip.